You know we love a good theme here at Mod Circus, so with Valentine's Day coming up, we just couldn't resist styling some looks to celebrate. Since I recently took my hair from rose gold to way more pink, I thought this would be a good chance to get really obnoxious with a pink/red combo. And what better time of the year is there to style every shade of pink and red in one ensemble? None. None time is when. A red ruffle top screams Valentine's day, and this one is even more perfect because of the rose pattern. This one has been in my closet for a few years, but the with ruffles anywhere and everywhere right now, it's perfectly on-trend this year as well! 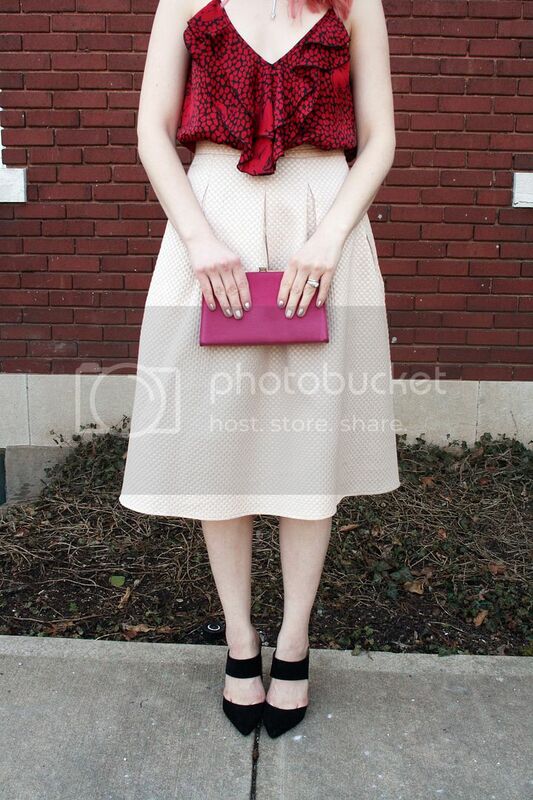 To balance out the busy red top, I went with a sophisticated blush midi skirt. Black heels polish off the look nicely for an elegant date night look. 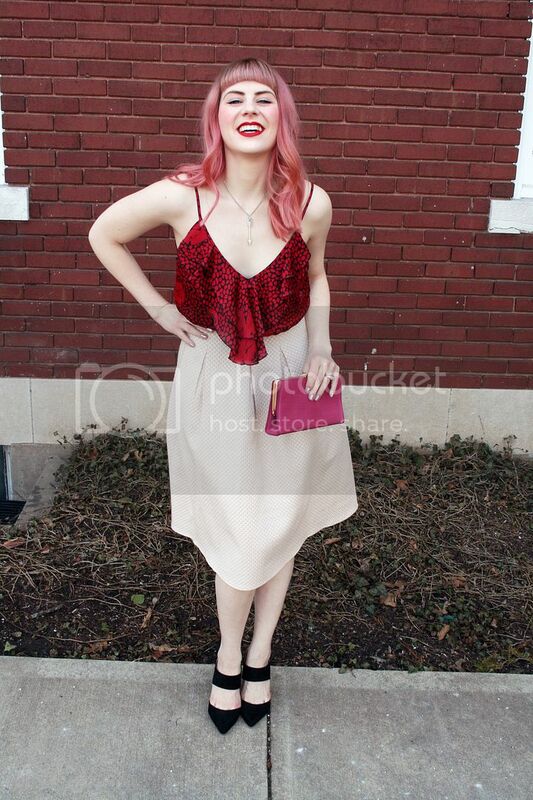 Since I was looking for a clashing pink-red vibe, rather than a harmonious flow, I threw in a hot pink vintage clutch, so my hair wasn't the only thing competing with the red. It will fade to a nice light shade soon enough, but for another week or so, I'll just have to make sure it's not conflicting with any colors too much. Do you like dressing up for themes as much as we do? Get more inspiration with Jodi's silver look here, my retro floral look here, or Jodi's avante-garde look here.